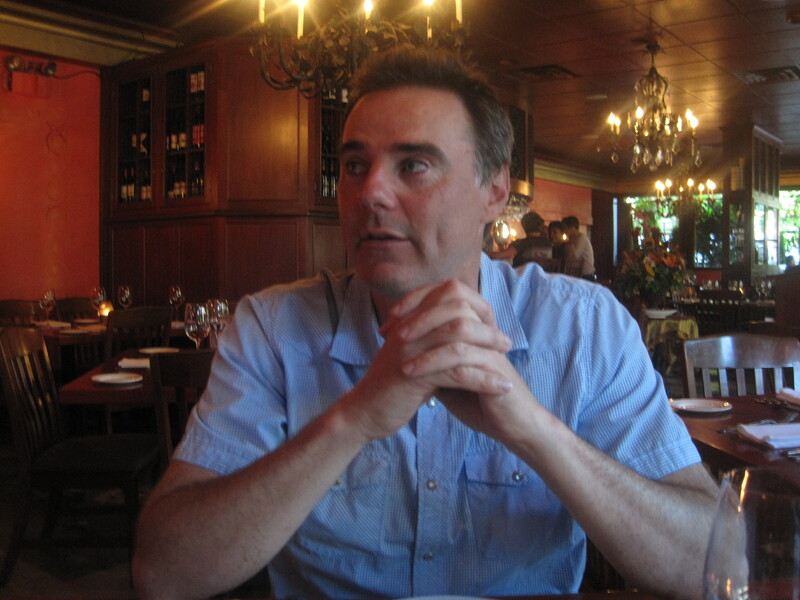 Joseph Mallozzi's Weblog: July 30, 2010: Dinner with an old friend! News of Note! 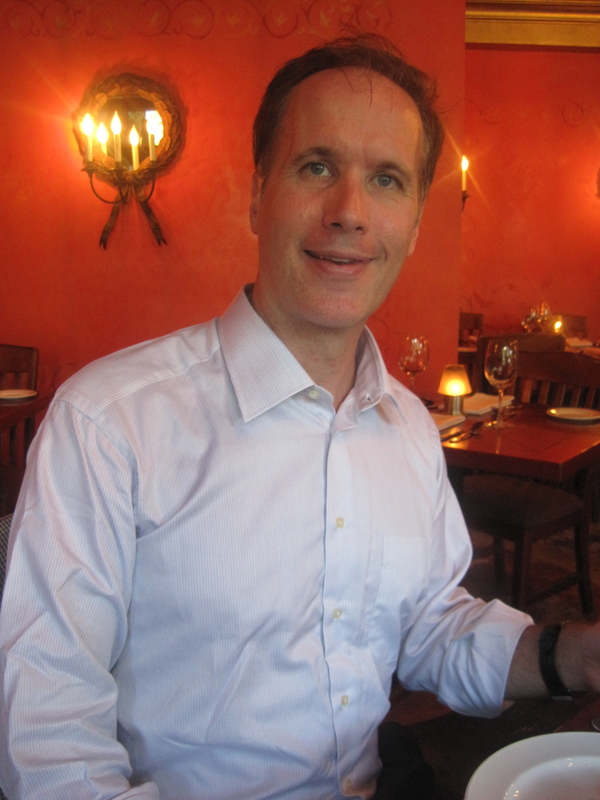 July 30, 2010: Dinner with an old friend! News of Note! Last night, I had dinner with a friend I hadn’t seen in over twenty years. Way back when, Rob was a fellow comic collector and the Alex P. Keaton of our high school. He was smart, had surprising business savvy for someone his age, and seemed destined for life as either the CEO of some Fortune 500 company or a highly successful stock broker who would make his fortune early and then retire early to some Caribbean island. So when I later heard that he was pursuing a college degree in engineering, I was shocked, then not surprised to hear he’d given up on engineering, then even more shocked to hear he’d given up on engineering to a philosophy degree. Regardless of what he chose to study, I was happy for my friend. My dear, clearly very crazy friend. I lost touch with him after that and didn’t hear from him for some five or six years and then one day, out of the blue, he called to tell me he was in town and wanted to get together. I told him sure and suggested we meet up at the local pool hall my writing partner Paul and I used to hang out at. I made plans to meet with Rob, but didn’t tell Paul who would occasionally ask: “Hey, whatever happened to Rob?” like he was some t.v. child star who’d disappeared following the cancellation of his outrageously successful sitcom. I remember talking to Paul, who had his back to the pool hall’s entrance, when I spotted Rob come in and head toward us. I chatted away as though there was nothing unusual and then, as Rob stepped up behind our table, fell silent. Paul, perhaps sensing something was up, cast a quick glance over his shoulder and spotted Rob who had suddenly apparated like a ghost from his past. It’s the closest I’ve seen Paul to passing out. Anyway, we had a great night, caught up and, just as he’d done some six years earlier, Rob disappeared into the night never to be seen or heard from again. At one point, back in SG-1’s fifth season, I managed to exchange emails with him – before losing track of Rob again. Finally, fast-forward to a few weeks ago when I received an email from none other than my buddy Rob. He was passing through Vancouver and was wondering whether Paul and I wanted to get together for dinner. This was a once in a decade opportunity. Hell, yeah we could get together. 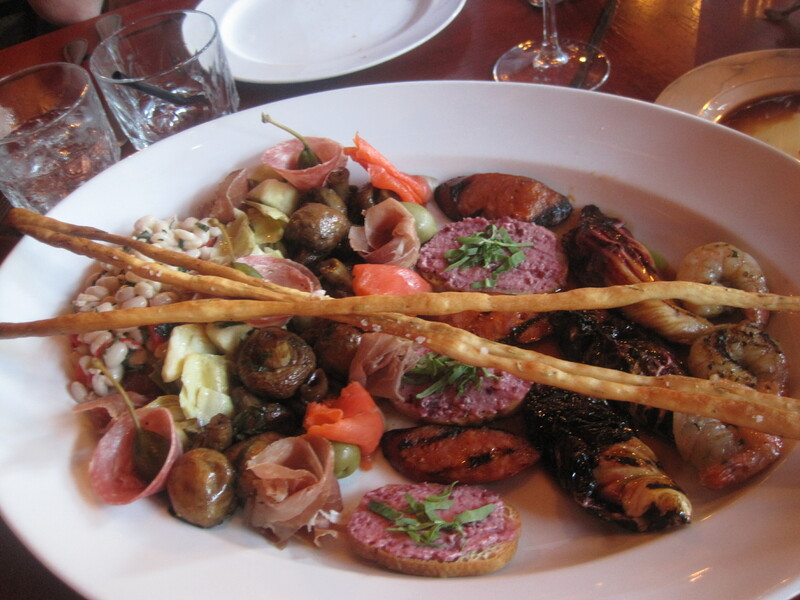 The house antipasto platter. A little of everything. Rob reports he sold off his comic collection years ago. 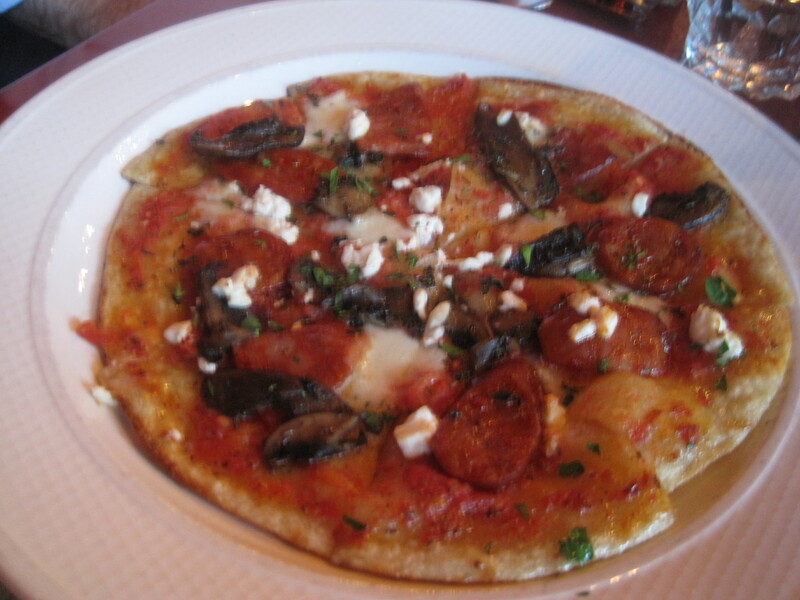 Q4 recently added pizzas to their menu. This one, with chorizo sausage and mushrooms, was outstanding. My writing partner Paul prays they don’t forget his Spaghetti Quattro. They didn’t. 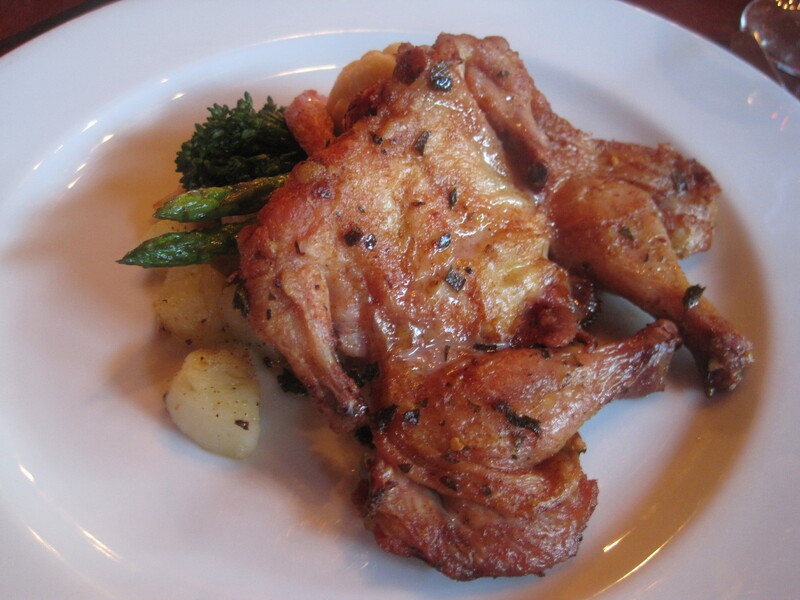 I always go with my favorite – the Cornish Game hen. It also happens to be my dogs’ favorite when it comes to leftovers. 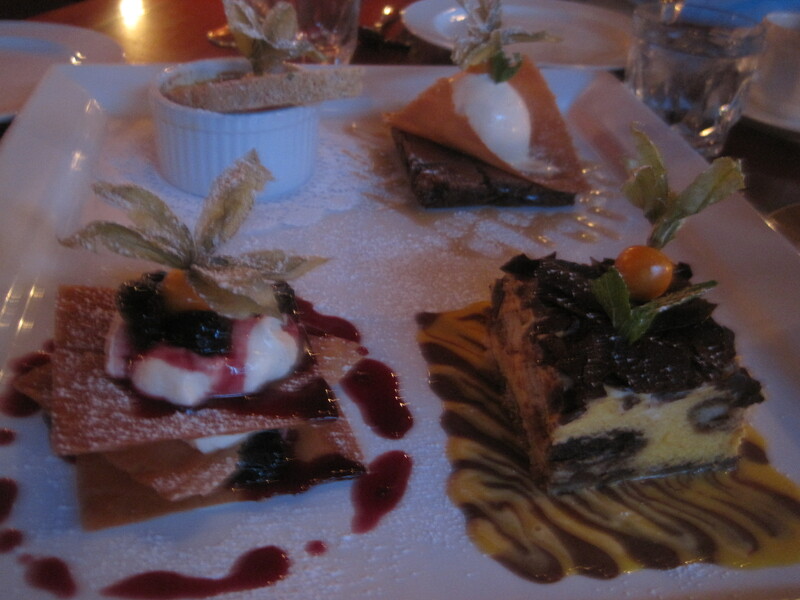 The Dessert platter. 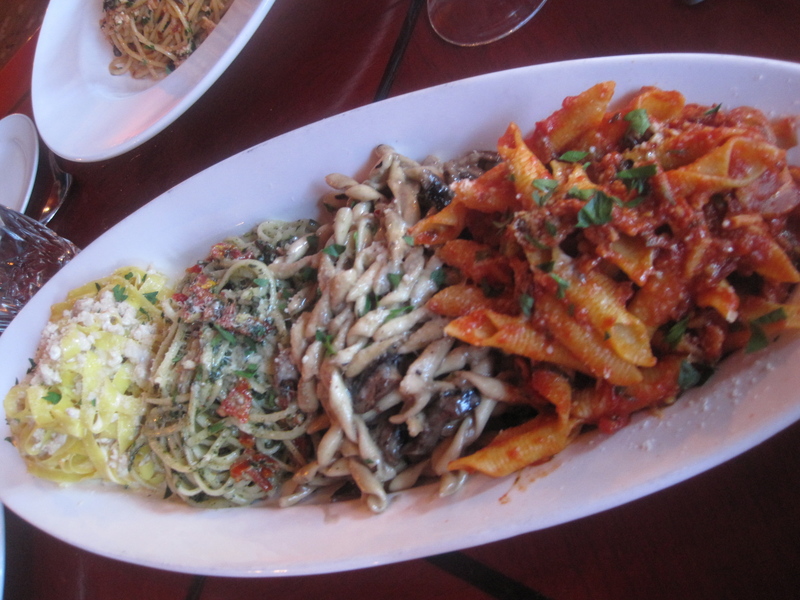 Okay, unlike the pasta platter, there is no dessert platter on the menu. I just ordered all the desserts on the menu. Incidentally, Paul hogged the creme brulee. A great evening of catching up after which I dropped Rob off at his hotel and watched him disappear into the night. Hopefully, it won’t be another twenty years before I see him again. As for how things worked out for him – he never did become the CEO of a Fortune 500 company. He did, however, make his money on the stock market and retire early to a Caribbean island. Previous Article July 29, 2010: Author Alastair Reynolds Fields Your Questions! Next Article July 31, 2010: Locus weighs in on Masked! Yet another guilty pleasure! Bubba, cool and crazy! Mailbag! oris and ancients formed only one before. We have never had the opportunity to be able to observe one of alteran ship. given that the destiny is the oldest ancient ship we have ever known. A generator of supplement was used by o neil to join ida’s galaxy. Is you it as powerful as the E2PZ of the ancients? So, why would anyone want to be the best at soccer in NK? Oh, yeah, maybe the players get fed for a while. I saw a documentary where a NK girl of maybe 8 yrs. old said things like “when I was younger, I didn’t like doing things in large groups.” I realized she was actually talking in code, meaning, as long as she expressed herself in the past tense, her family was safe (her family was living in a nice town because of her place on a team of children who put on mass choreographed shows). What a life. When I was 8, I had no idea how to speak tactfully, much less protect my family with code talk. I think Rob made a fine choice. Philosophy degrees are awesome. Who cares if you never make a million from it – there’s more important things in life than money. Oh, Rachel Luttrell – she was wonderful as Teyla. Teyla, like Philosophy, was also awesome. 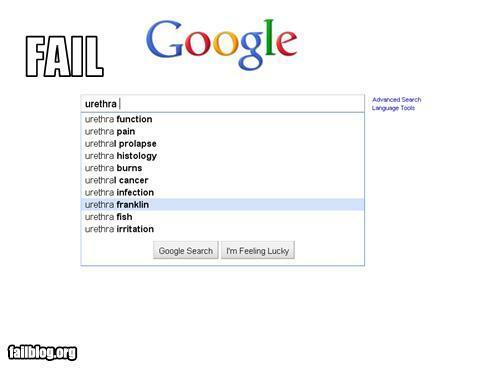 LOL….Urethra Franklin…..I’m still laughing at that…. Now while I was perusing the Soccer article I noticed an article calling our Miss Universe costume a “national joke”. I happen to love it! I might not be wearing it to work or for dinner next week but its Miss Freaking Universe…the outfits are supposed to raise eyebrows and other things. Now onto the nuclear explosion time-lapse…that was scary..may I share the following site with trailer for upcoming film Countdown to Zero – a world w/out nuclear weapons…I’m in http://bit.ly/9xS9Gy. <blocquote?Countdown to Zero is directed by Lucy Walker and produced by the Academy Award winning producers of An Inconvenient Truth, Lawrence Bender and Participant Media. The film will open in U.S. theaters July 23. The film is a fascinating and frightening exploration of the dangers of nuclear weapons, exposing a variety of present day threats and featuring insights from a host of international experts and world leaders who advocate the total elimination of nuclear weapons. Countdown to Zero is a chilling wake-up call about the urgency of the nuclear threat. It tells the striking story of uncertainty, exposing the real possibility of nuclear disaster and revealing the truth behind an issue on which human survival itself hangs. Does anyone have any magic cures for the dread TMJ (temporomandibular joint) disorder? Life is not good when your face hurts all the time. I feel your reply was somewhat ironic but a lot of people are taking it quite litteraly (at least on French forum), should I do so? I’m hoping it’s a temporary farewell and will be back in a few months once things have settled down. My new role is already unrecognisable from what was originally planned. I now have a bigger team, bigger projects to run which always seems to mean more meetings therefore more offline. I’ll have web while I’m away but will be working until 11pm each night. That’s still less stressful than having to know every detail of what is happening in an organisation. All relative I guess. Have to come back for the day at least for the Masked BOTM discussion! More or less than you thought? More, of course. Now who’s going to keep me in line? When you feel a disturbance in the force, know that it is I. It’s that or das with the voodoo doll again. Crap, Narelle…I forgot the voodoo dolly! I gotta dig that sucker out…I think it’s in my sock drawer somewhere. Crap! What did I miss?????? Where are you going?? Off to read the last blog entry……..
p.s. Joe, get back the the script, oh and start working on a new WFPOTD vid….its been [insert no of days, I’m lazy] days since the last one. Aww Narelle *massive hug* ….have fun in Bali and on all of your travels. You’ll do a fantastic job in your new role in the company and be a great support to the new boss. Joe, if you haven’t already got something like it organised can we make tomorrow’s blog the Bon Voyage Narelle, come back to us soon blog!!! Sadly the clock will not go back to zero for nukes. It might be rewind a bit but not much. Nuclear fission devices are easily assembled with early 50’s era technology. It’s getting the fissionable material that is hard, mostly due to the scale of the project and the long material processing time required. Almost any competent Engineering grad can assemble a crude fission device. Mind you it might not function efficiently. And handling the fissionable matter will be quite hazardous. For me if nukes are not tested periodically than their deterrent value will diminish. Unless you actually explode a nuke, there is no guarantee it will work. So if the United States still have nukes after the next US presidential term, the pressure to test will be immense. Along with the need to restart Tritium gas production to replenish the naturally radioactive decaying supply. Tritium gas is required for modern thermonuclear fusion devices. Which can produce 110 mega-tonnes energy yield in a small beer keg size unit. I don’t think nukes will fade away any time soon. They more or less replaces an even more expensive conventional Military force after all. @Sparrow_Hawk: I feel your pain…literally. The general advice on reputable websites is to manage the pain and avoid procedures that will make permanent changes to your jaw and mouth. I’ve been doing just that since this past winter. Multiple Ibuprofen and warm compresses help. I like the microwavable /freezable, re-usable gel or bead packs. Google National Institutes of Health (USA) and the Mayo Clinic and search “TMJ pain”. Both are good starting points. The dentist I see is a member of the American Academy of Orofacial Pain. There’s a searchable member directory on their website. I know you have the audi which is a nice car do you have an interest in them at all? Hows jelly doing now shes had her stiches out? has there been any more improvement. would there be any possiblility of seeing a vfx screenshot of the whole of the destiny or are you keeping certain parts of it a secret? or could we see the concept art like the one you released fro episode 10 Justice. Mailbag Q: Is the Destiny Expedition going to find some supplies of alien coffee, and then become addicted to said alien coffee? Good luck with the new assignment, Narelle! And congratulations on not having to be the boss any more. But I’m sorry that you’re going to be away from Joe’s blog. We’re going to miss you dreadfully. Try to stop by once in a while and let us know how you’re doing. And post some pictures of the wonderful exotic places you visit on your blog, please! Man does that desert look good. SO does that pasta. As for the others… well, whats the phrase. Not entirely my cup of tea. What can I say, I need to expand my eating horizions lol. Im a bland guy. WOW! Thats kind of creepy. Hes been dead for 30 years? 1. Just curious, why do you film episodes out of order? Specifically why did you film Visitation out of order? 4. MGMs latest Debt extension goes to mid september, so its unlikely they’ll greenlight any projects till then. However, if you received the greenlight for the movies in late September or October, could you still film the movies over SGUs season 2 hiatus? Sorry if im bugging you with questions. I JUST REALLY REALLY REALLY REALLY REALLY REALLY want to see theses movies. I guess since I have not much to do in the summer this is my number one thought. I mean every time I watch SGU or think about the franchise I think about the movies and how I should be sitting watching extinction air on syfy in a few weeks and I should be admiring my Revolution DVD. Its just really depressing and it makes me just want to give up on the franchise. I mean, id still support SGU and watch it and buy the DVDs…. but I just want to delete my account at GW and not be involved in fandom anymore. Id rather go get involved in Battlestar fandom. I mean… their show ended in March and they got a movie in October.. SGA ended in January and we got a movie…. well not till over 2 1/2 years later at the least. I mean realistically I can’t quit fandom, because im committed to the Stargate Movies Campaign… And mailing letters and sending messages has helped, and I encourage everyone else to do so… I really makes you fell better and its better then doing nothing… But I really hope we hear something on the movies soon…. Otherwise im gonna go nuts.